Archie Panjabi is a British actress, best known for her role as Kalinda Sharma on The Good Wife. Her portrayal has earned her a Prime time Emmy Award in 2010 and an NAACP Image Award in 2012, as well as two further Emmy nominations, one Golden Globe nomination, and three Screen Actors Guild Award nominations shared with the cast. 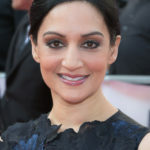 Her other notable roles include Yasmin Husseini in Yasmin (2005), Pinky Bhamra in Bend It Like Beckham (2002) and Asra Nomani in A Mighty Heart (2007). "I’d love to do a romantic comedy. And perhaps, if the character was right and I had a good gut instinct, a Bollywood movie. And I’d love to direct. One day. I’m learning a lot on the set of ‘The Good Wife.’"
"I don’t ever want to be hugely famous because I had a little taste of it after ‘East Is East’ and ‘Bend It.’"
"I knew from a young age that I wanted to be an actor. I never even thought about other careers. The acting field is certainly not the path many Indian parents encourage their children to take, but mine were very supportive. They wanted me to have an education, but understood that this is what I wanted to do." "Coming to New York is like a big hug, everyone is so welcoming. There’s something about here, everyone makes you feel so at home. I miss my family of course, but I don’t miss London that much. I was worried, but I feel really at home. Everyone says that who comes here from London, but I didn’t believe them." "My mother wanted to be a teacher when she was young, and my father didn’t approve of it, so she fought very hard to become one. And she did it. So when I said I wanted to become an actress, my mother was very supportive. She always said to me, ‘There’s no such thing as ‘can’t.’"
"There is a big misconception about arranged marriage. Yes, it can mean that you meet someone and then have to marry them, but this was my mother saying, ‘I’m going to introduce you to so-and-so – If you don’t like them, fair enough.’"
"It was the success of ‘Bend it Like Beckham’ which got my name out there. ‘A Mighty Heart’ also helped." "When I was younger I was fat. I was never conscious of it and was content with who I was because I was so loved. My mother never told me to lose weight and my father doted on me, but my agent told me. I tried, but I loved Indian food too much." "I like to cook Indian food when I can. I find the process of creating a home-cooked meal to be unwinding."